Hawthornia is an herbal formula which has been used for hundreds of years by practitioners of Traditional Chinese Medicine (TCM). The Hernia Coach used Hawthornia and found that it really does shift the internal energies in the abdominal region by re-balancing them and by appropriately moving the qi. Hawthornia does not work fast; rather, it is a slow-acting synergistic herbal preparation that works deeply in the tissues and related organs. Over the course of time, the lower abdominal area can be sufficiently strengthened and tonified so that the organs eventually fall back into their proper place. The following post by Tao of Herbs provides additional information and TCM insight that may be useful for those who are unaware of this powerful herbal formula. Their website is Tao of Herbs. Are you aware that there are roughly 5 million hernia sufferers in the US, yet there is no medication available? The only recognized treatment is an invasive surgical procedure. Only 700,000 hernia sufferers choose to have surgery, because the surgery is both costly and painful. Others (which may include your friends) just suffer silently and waiting for a cure to emerge.The good news is now we have a 100% natural herbal remedy Hawthornia to relieve (non-hiatal) hernia symptoms. 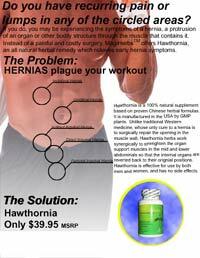 Hawthornia is a 100% natural herbal formula well proven in China to be very effective for hernia and other related problems caused by general weakness or over-exercises. Hawthornia relieves most symptoms of groin, femoral and inguinal hernias, and some of umbilical hernia. It works on the principle to strengthen the support muscles for internal organs, such as intestine, so that the organs won’t fall through any hole or opening in the body diaphragm. Of course, it works best when little symptoms have been felt, if the lump becomes too big, and symptoms remain after 2 bottles of Hawthornia, you may need an operation to seal the opening first. Then take Hawthornia also help to prevent symptoms happen on the other side of your lower abdomen. Usually after taking Hawthornia for only a few days, the symptoms are lessened, then you can stop taking Hawthornia, or only take low dosages (as 1-2 capsules per day) to maintain muscle strength, or only when the symptoms come back again. People under 12 should take half the dosage suggested on the bottle. Take 2 capsules three times day. For best results, take before meals. Do Not Take Hawthornis with stomach ulcer or in high fever. Each bottle contains 60 capsules of 500 mg standard herbal extract. Manufactured and bottled by an FDA approved GMP factory in California, USA. 1. What is Hawthornia made of? The 4 major ingredients are hawthorn, fennel, citrus seed, and litchi seed. With a speical process these natural herbs are combined together to produce the magic effect on the strengthening of lower abdominal organ support muscles. 2. How does Hawthornia work? The herbs work synergically to strengthen the organ support muscles and tissues in the lower abs, so that the organs, including intestines, will go back to stay in their original positions, the they won’t fall into any opening on the body wall. Thus the symptoms of hernias disappear. 3. How many bottles are needed to remedy one’s problem? It varies depending on individual’s conditions, usually one bottle is enough. Serious cases may need two or more bottles. If after 2 bottles, symptoms have not improved, one definitely needs surgery. But this is a seldom occurrence, unless one had a surgery before taking Hawthornia. Although Hawthornia can prevent the same organ falling to the other side of abs, it cannot heal the wounds caused by the surgery. Therefore, early usage of Hawthornia is recommended, it may negate a surgery. 4. How does one know one has a hernia? Although it is easy to feel, we recommend one should consult a doctor to confirm. If the doctor suggests a surgery, try Hawthornia first. This herbal remedy has been widely used in China with no side effects. Is There an Alternative for Hernia Surgeries? If you don’t think there is help for hernias, you don’t know about Magi-Herbs Hawthornia formula.PROBLEM IN MEN & WOMEN when pains or cramps occur in the lower abdominal area, it may be a sign of a hernia or other muscle discomfort and weakness. Some five million people suffer from hernias in the United States. Especially vulnerable are athletes, persons who do heavy lifting and those who are obese in the abdominal area. While surgery is a last resort and can be life-saving in acute situations, many doctors simply send their patients home without doing anything more than telling them to avoid heavy lifting or other activities that could aggravate their condition. A hernia is a weakness or defect in the abdominal wall. It may be present from birth, or develop over a period of time. If the defect is large enough, abdominal contents such as the bowels might protrude through the defect, causing a lump or bulge felt by the patient. Hernias develop at certain sites that have a natural tendency to be weak, such as the groin, umbilicus (belly button), and previous surgical incisions. Once a hernia has developed, it will tend to enlarge and cause discomfort. If a loop of bowel gets caught in the hernia, it may become obstructed or its blood supply may be cut off. This could then become a life-threatening situation. Since hernias can be repaired effectively and with minimal risk, most surgeons therefore recommend that a hernia be repaired when diagnosed, unless there is a serious medical problem that makes it too risky. Since there are generally no medications for hernias, the standard method of hernia repair involves making an incision in the abdominal wall. Normal healthy tissues are cut until the area of weakness is found. This area, the hernia, is then repaired with sutures. In the more advanced laparoscopic repair method, the defect in the abdominal wall is repaired from the inside of the abdominal cavity. Instead of closing or patching the repair from the outside, the patch is secured in place from the inside. This eliminates the necessity of cutting the skin and normal tissues to get down to and repair the hernia. Often a prosthetic material, such as Gore-Tex or another plastic material, is sutured in place to strengthen the area of weakness. HOW TCM HELPS HERNIA SUFFERERS Hawthornia is an all-natural Traditional Chinese Medicine herbal formula well proven to be effective in relieving hernias (except hiatus hernia) and other related symptoms caused by general Qi weakness or straining. Hawthornia relieves most symptoms of groin, femoral, and inguinal hernias, and some umbilical hernias, especially in the early stage of occurrence. It is also helpful to persons who have undergone hernia surgery. The 11 ingredients in this traditional herbal mixture are hawthorn, fennel, citrus seed, litchi seed, Chinaberry fruit, peach kernel, corydalis tuber, three-nerved spicebush, nutgrass flatsedge, kelp, and oriental water plantain. With a special process, these natural herbs are combined together to produce the synergistic effect associated with TCM formulas, to improve Qi and to strengthen the lower abdominal organ support muscles and tendons so that the organs, including the intestines, will be uplifted back to their original positions. Thus, they won’t fall into any opening in the body wall and the symptoms of hernias are relieved. This herbal remedy has been safely used in China for hundreds of years with no side effects. EIGHTEEN-YEAR OLD DAVID* WAS DOING SQUATS (a weight-lifting exercise that involves heavy quadriceps lifting) under extra-heavy loads. Some days, he felt pain that extended from his lower abdomen into his groin. “From what I’d heard in the gym, it sounded like a hernia.” He began experiencing chronic pain in his groin area with a small palpable lump. “I went to see a doctor and after he examined me, he told me I hadn’t actually ruptured anything, but to avoid heavy lifting until the symptoms went away. The symptoms persisted for almost a month before I tried Hawthornia.” He used the formula (then as a powder) three times daily. “I remember the first time I used Hawthornia, it cured my hernia symptoms within three days and I could resume squatting.” * Last name withheld for patient privacy. This entry was posted in Uncategorized on June 8, 2014 by The Health Coach.